Exporter of a wide range of products which include rop cap sealing machine. Rop Cap Sealing Machine is manufactured in adherence to the predefined industry norms to ensure durability and tough construction. Made available in numerous specifications, these low maintenance machines are massively demanded in the market for their noiseless operation, speedy performance and large production capacity. 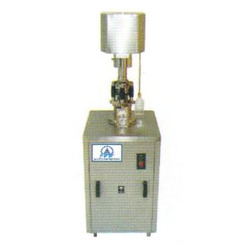 Rop cap sealing machines are provided at affordable rates.